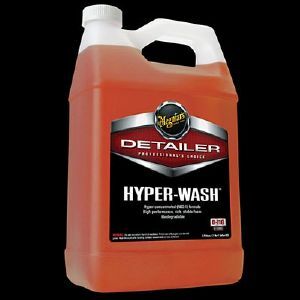 Meguiars hyper wash super concentrate Typical foam wash product dilution rates are obsolete when comparing them with Meguiars Hyper Wash. Using innovative technologies, Meguiars have created a product that produces rich, stable foam at an unbelievable dilution rate of just 400:1 (water:product). Meguiars Hyper wash has a biodegradable formula that safely and effectively lifts dirt and grime off all exterior surfaces, and is just one of the many products available in the meguiars detailer range of products which range from wash, to wax and glass cleaning. Also available is our handy chemical resistant spray trigger bottles.